According to new public opinion research released today and commissioned by Nationwide Children's Hospital, 87 percent of Americans agree there needs to be more mental health support (including increased treatment, therapy and prevention resources) available to help children and adolescents in their communities. 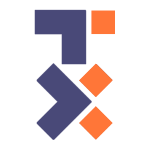 The Harris Poll, one of the longest running surveys tracking public opinion in the United States, conducted the survey in February and March of this year. Of the 2,000 total respondents, 500 were parents with children younger than 18. 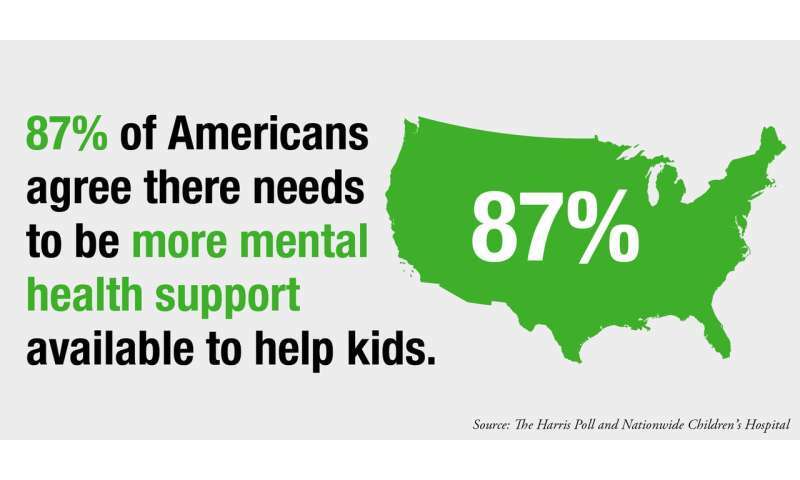 One-third of these parents (37 percent) say there is a child or adolescent in their life who they think may need mental health support. 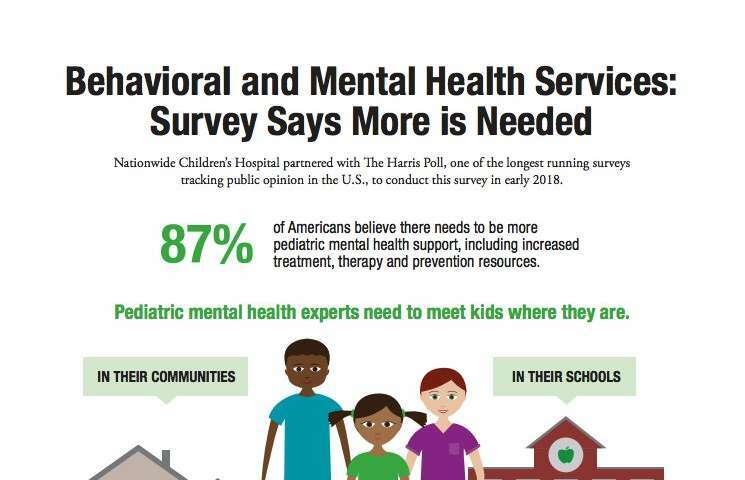 "The survey confirms the public knows what the research shows and what we see in clinic - the need for pediatric behavioral health services is significant," said David Axelson, MD, chief of Psychiatry and Behavioral Health and medical director of Big Lots Behavioral Health Services at Nationwide Children's. In the survey, families identified expense (37 percent) and insurance coverage (33 percent) as the primary barriers to accessing to pediatric mental health services. This is why a critical area of focus for Nationwide Children's Behavioral Health is prevention. Pediatric mental health experts meet kids where they are in their communities and classrooms. For example, Early Childhood Mental Health provides consultation and training for preschool and homecare providers to prevent preschool expulsion due to behavior issues. Expulsion rates of children prior to kindergarten are at rates up to 34 times higher than the rates of children expelled from kindergarten through 12th grade, combined. The Center for Suicide Prevention and Research offers an evidenced-based suicide prevention program for area middle and high schools. "The goal of programs like these is to remove barriers and intervene before a family ever needs to come to a provider's office," said Dr. Axelson. Nationwide Children's is working toward increasing access to mental health services by opening the Big Lots Behavioral Health Pavilion, a freestanding facility fully dedicated to children and adolescents with behavioral health conditions. Thanks to a transformational $50 million gift from Big Lots and Big Lots Foundation, upon completion in 2020 it will be the largest behavioral health treatment and research center dedicated to children and adolescents on a pediatric medical campus in the U.S. Solely devoted to children and adolescents with behavioral health challenges and mental illnesses, the Pavilion will be nine stories at completion. The space will house behavioral health researchers and foster collaboration between community partner agencies. It will also provide the opportunity for expanded education and training for those in the mental and behavioral health field. The approximately 386,000 sq. ft. building will be home to integrated behavioral health services including a Psychiatric Crisis Center with an Extended Observation Unit, a Crisis Stabilization Unit, inpatient units and intensive outpatient programs. The hospital will continue to grow services across their multiple community locations and increase attention to integrating behavioral health care in to primary health care settings. "There has been growing awareness of the importance of behavioral health disorders in children, which have the potential for long-term, negative impact on their health and society," said Dr. Axelson. "Many communities like ours are thinking about how to improve access to high quality behavioral health services because it is the right thing to do."